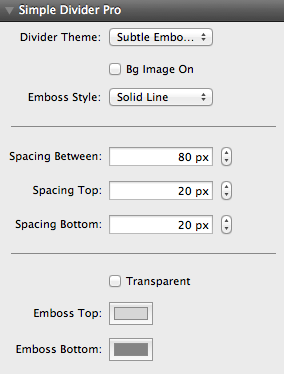 When Subtle Emboss is selected the “Emboss Top” and “Emboss Bottom” options below will be used. When “Solid” is selected the “Solid Height” and “Solid Color” will be used. The “Emboss Top” and “Emboss Bottom” options control the color for the top and bottom line of the divider. The “Solid Height” controls the height of the “Solid” theme divider and the “Solid Color” controls the color of it. Added “Emboss Style” control – emboss line options added: solid, dashes, dots.